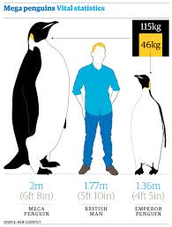 The emperor penguin is the largest of 17 species of penguin at 1.15 m (45 in) tall. It is also the only animal to inhabit the open ice of Antarctica during the winter. They face wind chills as cold as -60°C (-76°F) and blizzards of 200 km/h (124 mph).